We always have a luck with tvN dramas. They are unique conceptual and re watchable. A time travel fiction drama ful fill our desire to watch a unique drama full of thrill, suspense, story and all aspect of time travel. We started watching Nine times travel. There were two reasons we choose it firstly it was the title secondly the male lead Lee Jin-Wook. Previously we watched him in Before and after plastic surgery, Spy MyeongWol, Powerful Opponents and I need Romance 2. So we were expecting another master piece hit this time. The story was too interesting it started from the 9 Sticks that made Sun-Woo travel through time and every time he travel there is a mystery half solved remains behind. 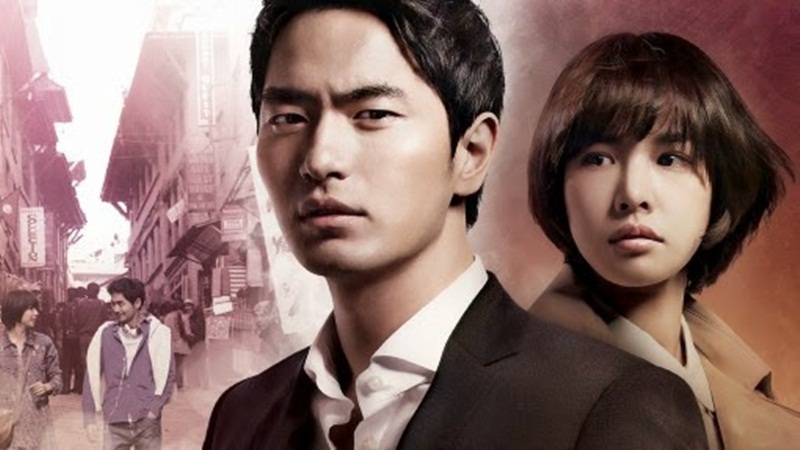 The drama mocked out all the time traveling stories and come up with a unique theme of revenge, hatered, travel, crime, murder and yes also romance. Sun woo was the famous news host anchor while Min young was the reporter. At first we become confused about the story where will it started and in between it turned out something else. Though Sun-Woo and Min-Young were meant for each other but how both will come closer was the main mystery and the second mystery why Sun-Woo travel through incense sticks. It was very hard for Sun-Woo to bear what is going on with him. He couldn't able to find the real reason why he saw dreams and follow the incense stick to follow back in time. So this made us paid more attention to understand the story. Our all curiosity for time travel and fairyland world woke up. We both sister also discuss how the life was back then and were curious what was a beeper who invented it? The whole story was balance with fusion as if it was written for the actor itself and the plot every time take our attention to its every turn. At some moments this drama gives us the impression of super natural element where the time stops and Sun Woo travel half of the past and the episodes ends he come back. Some time he talk with the people in the past and also dream the back time events but many things were unclear to Sun Woo and also us. While watching the drama it took 3 days when ever unexpected guest arrive we got irritated saying oh no we have to complete the drama what will going to happen next. We eagerly wai8t for the guest to leave, complete the household work and ready with the mid night snacks to watch the drama. As if we are watching it in the cinema with chips, coke and popcorn and our only target to complete it with in no time. It was getting more and more interesting as the clues and hints Sun Woo getting were solved. Things becoming clear and the delima he was in was releaving. Sun woo found 1 incense stick from his elder brother belonging and with the help of that stick he travel back to find out the reason of his brother death. Coming across many hurdles he found nine incense stick box. With the help of the stick every time he travel back to solve the mystery. He avoids min young but she every time found the chance to cling on Sun woo. These were very cute and enjoyable moments. The story was getting more tense and full of curiosity. Sun woo who obtained 9 incense sticks which helps him travel back as a time machine to help solve him the mystery of what he is seeing. The death of elder brother, father and the current position of his mother. He found every clue which lead him to the past. But he had to wrap up the time to come back in future before the stick stop burning. This time travel was about 20 years back as we were the old scenes, items in the drama make us feel we went back with Sun Woo. It was very thrilling and informative for us and we were feeling how the life was back then 20 years. Sun Woo self utilize to himself to change the course of time into past change the events and protect the people he love. Sun Woo placed web cam in his fathers office to find out the real truth , what happened at that night, why every one hides the truth. So he traveled back to knew the truth. He tried his best to change but the thing written in heaven never changes it continue as written but the time, place, event, people change. It was a thump thump moment we were holding our breaths will Sun Woo able to solve the mystery by finding the truth, and will he come back to future or not? So the technology proves its importance. The past event 20 years back recorded by a cam and Sun Woo come to knew every thing. It was very shocking we weren't expecting it nor Sun Woo. But bravo the writer he give a twist in that turn to the story and director with the help of actors pulled life in it. One of the employee at his father office set fire and Sun Woo saw him. So the employee order someone to kill Sun Woo. As Sun Woo traveling in the past he got hit by that person the second time. First it was when he was a kid 20 years back and now when he was 40 it happened again he jumped in to the water and came back to future with a deep wound on his body. People at Sun Woo's work place were also curious the room was locked from inside there is no other way to go in out how come Sun Woo in an critical wounded position. Sun Woo best friend was so scared he prayed to GOD this stick is the basic of all the problems please help us to get rid of the stick and in no time the remaining sticks vanished away. OMG he became more scared Sun Woo was angry and we were curious the sticks are vanish away what will going to happen next. Our mother called us its early morning don't you have a sleep what are you doing? So we had to say good bye to Nine time travel. Man we were bussy the whole day long didn't get enough time to watch the drama. We got free at night and set an atmosphere to watch our favourite drama. The doctor Jin-Cheol was the accomplice to all what all happened 20 years back. He was also very clever and didn't want to leave any clue behind. He also remember seeing Sun Woo in his dreams and found the remaining incense sticks of time travel. While he was hospitalize by playing a fake act of being a patient to avoid the prosecutors. He use incense sticks to travel back in time and also order someone to take care of it properly. Sun Woo manage to follow doctor Jin-Cheol and tried his best to stop what he was going to do. The efforts of Sun Woo some how went in vain he saw the incident of her brothers wedding day. He tried to help and change the event but all in vain. He couldn't able o do so. On the other hand doctor Jin-Cheol showed his madness by shouting he can't travel back with the time machine. He can't change the events nor his plans. Sun Woo while in the time travel of 20 years calls his elder brother and told him he had a lot of time to change his decision. Sun Woo acts was only to protect the people he love and cared the more. Sun woo didn’t knew that the change he made to happen will affect the present time as Min-young who was with him vanished and became his niece since his brother in the past going to marry her mother Yoo-jin. Then the drama become too complicated again so we were confused Min young is his niece or his beloved. Wil they going to marry or will they broke up after knowing the truth. The whole story turns upside down rolling and rolling and rolling into nine times travel. It was hilarious to see doctor Jin-Cheol became a pharmist who lost his charm and conciousness. His brand new car tuned into an old car and his appearance as if he is weirdo. But he still want to clean up all the left clues so he didn't stop his evil planing to kill Sun Woo. But What to do Sun Woo's brother back then 20 year were ready to get married at the important moment of his life he recieved a call Sun Woo is in critical condition and wounded badly. He is in the hospital. The elder brother left his wedding to save Sun Woo. So what the elder brother did in the past again change the whole story in the future. He accept his crime and tell the prosecutor that he is guilty. Along Sun Woo's elder brother doctor Jin Cheol and his accomplice were also arrested for the crime they commit. With all happened in the past the future again changed. The preparation for Sun Woo and Min Young wedding were going on. Sun Woo elder brother called Min young congratulate her and asked her how would she liked to be addressed as sister in law or as niece? We weren't expecting this twist again. We don't know what comes in Sun Woo's mind he used the last remaining incense stick to travel back in time. But there he got stucked in an accident set by doctor Jin-Cheol he couldn't make himself to come back in time and stucked in the past and died there. Before dying Sun Woo tried his best to call someone for help. The young Min young appeared she helped him but it was od no use Sun Woo left a little time. He used his cell phone to record his last words. Sun Woo didn't make to come back and the wedding was ruined. The story in the future changed and the time 20 years further comes in future. Min young in the future when saw Sun Woo's picture who is he? i saw him in the past when i was a kid. So here is the twist unfolds herself. She was the young Min young who Sun Woo saw before dying. So Sun Woo's story ends there and that past story continues to the future where Sun Woo and Min Young are ment for each each. In this new future Min young again attracted by Sun Woo. She tried to seduce him but the act Sun Woo did make us shocked like Min Young. Min Young tried to touch Sun Woo chest he shouted i will call the police why are you touching me the office workers broke in the room and leave thinking both are in a relation to play with each other. We enjoyed this scene and laughed by the humor Sun Woo put by his act. Min young was expecting a french kiss like in the movies. Sun Woo was reluctant. He follow Min Young action kissed her deeply and then said now you won't a second kiss. So i am going to kiss you after 1 year. Hahahaha we laughed out lot at after one year. Again time repeats itself. What ever happened is written in fate and we have to accept it. Sun Woo went to find his brother again in this future timeline and found nine incense stick. This time round was too same as the previous one but Sun Woo didn't use the incense stickc to travel with the time. His brother left instead. He threw away the sticks and helped his brother to come back to life. He remembers his past and also the message left by the old Sun Woo. So he prefer not to swayed away by the nine time travel Incense stick. He did a right choice to make every thing become right. The connection of the sticks and Sun Woo was not fully explained in the drama but if you watch this drama keenly you will find a conclusion like we did. These sticks were only meant for the drama Nine: Nine Times Time Travel and linked to the story written by the writer about the vice virtue the villan, the victim. We the power full story of time travel we recommend you to watch this drama. We already watched it 3 times. On the whole it is said to be a re watchable drama. Its all till now lets meet in an another K drama review.